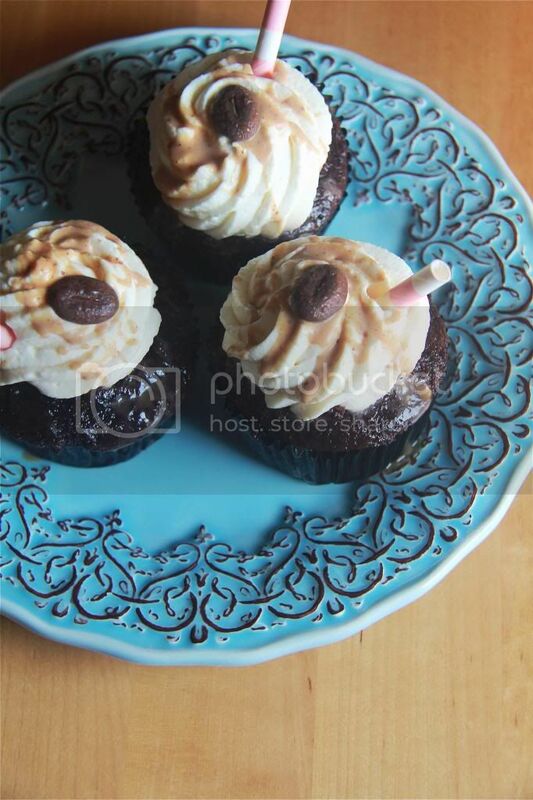 Crumbs and Cookies: salted caramel mocha cupcakes. At some point two drinks offered at Starbucks came to mind - salted caramel mocha and mocha cookie crumble. The first thing I noticed was that both had "mocha" in common. Joined together it became salted caramel mocha cookie crumble, quite the mouthful indeed. 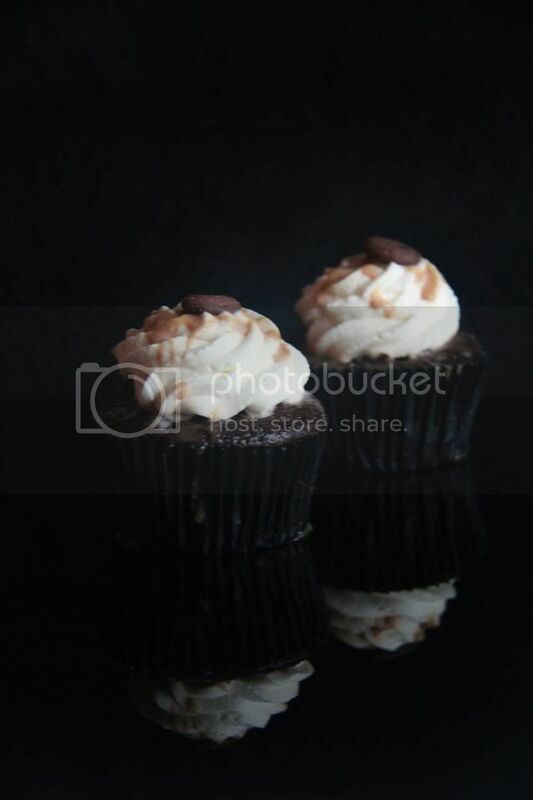 I admit, the name inspired the cupcake instead of the other way round. It sounded so extravagant and decadent that I couldn't wait to make these cupcakes, but in the end the idea couldn't come into fruition because I realised that it wasn't quite feasible. The cupcakes simply did not have enough surface area for me to incorporate all the elements. The "mocha" was easy - the mocha cake base would take care of that. I knew that I absolutely had to drizzle the salted caramel sauce over the piped whipped cream for the sake of visuals. But I couldn't just have that small amount of salted caramel constitute the salted caramel component of the cupcakes, that wouldn't be outstanding enough. 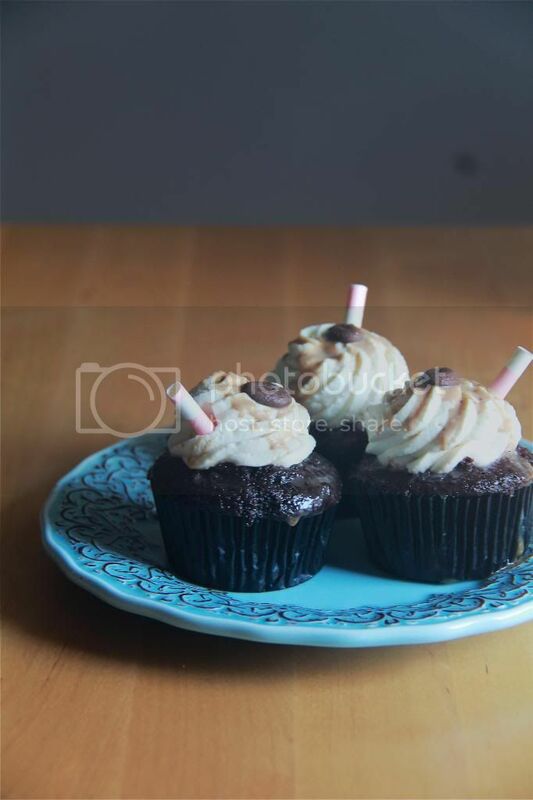 I figured that I had two alternatives - incorporate the salted caramel by hollowing out the centre of the cupcakes and filling the empty spaces with the sauce, or stab the cupcakes to death with a fork and pump the cupcakes full of salted caramel. To help me decide which way I should use the salted caramel, I then considered how I intended to introduce the cookie crumble portion. Again, sprinkling some over the frosting wouldn't suffice; I had to incorporate that in another way as well. I was faced with two options, which were to put some on top of the cupcakes before piping the whipped cream on or bake some into the cupcakes. If I were to go with the latter option, that would mean that I couldn't go with alternative number two for the salted caramel because I was afraid that too many flavours would clash. Pairing both option ones for the salted caramel and cookie crumble seems like a logical decision, but the thought that the cookies might soften and become soggy underneath that mound of whipped cream conveniently came to me suddenly. So I scrapped the cookie crumble idea. After all that trouble. Yes. Well there you have it, a sneak peek into my mind whenever I try to come up with something. I don't blame you if you couldn't quite follow. Sometimes even I myself can't keep up with what I'm thinking about! But if there's something that you can and must understand, it is that these cupcakes are delicious. They're incredibly moist and rich, the kind of cupcake that disappears in seven seconds. Make the salted caramel sauce: Heat the sugar in a medium saucepan over medium heat until it turns a deep amber shade. Remove from heat immediately and stir in the butter. Drizzle in the heavy cream carefully and stir until combined. Return to heat, stirring constantly until the caramel is smooth and void of clumps. Remove from heat again and stir in the salt. Cool completely before using. Assemble the cupcakes: Whip the heavy cream and sugar to stiff peaks. Transfer to a piping bag with a large star tip. Using a toothpick or something similar, poke multiple holes into the cupcakes. Spoon over the warmed salted caramel sauce. Be careful not to use too much. 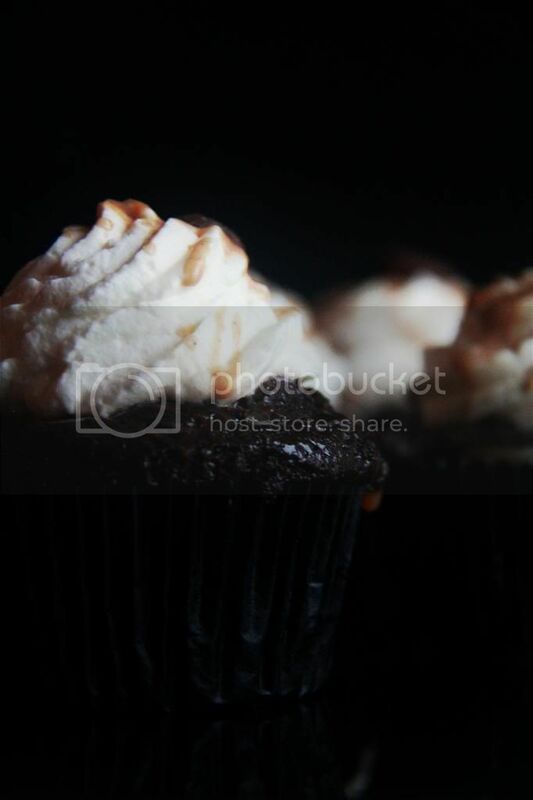 The idea is to let the caramel permeate the entire insides of the cupcakes. 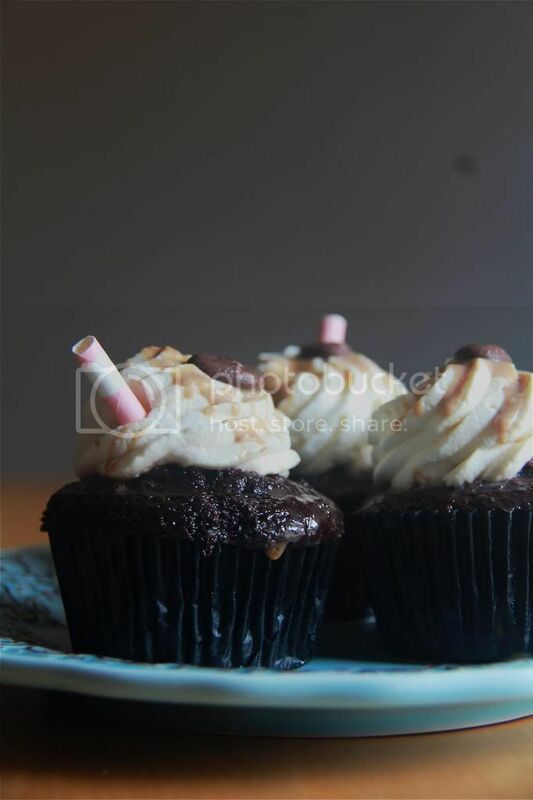 Place a bit of the chocolate streusel on each of the surfaces of the cupcakes. Pipe the whipped cream on top. Drizzle over the caramel sauce and top with a bit more streusel. 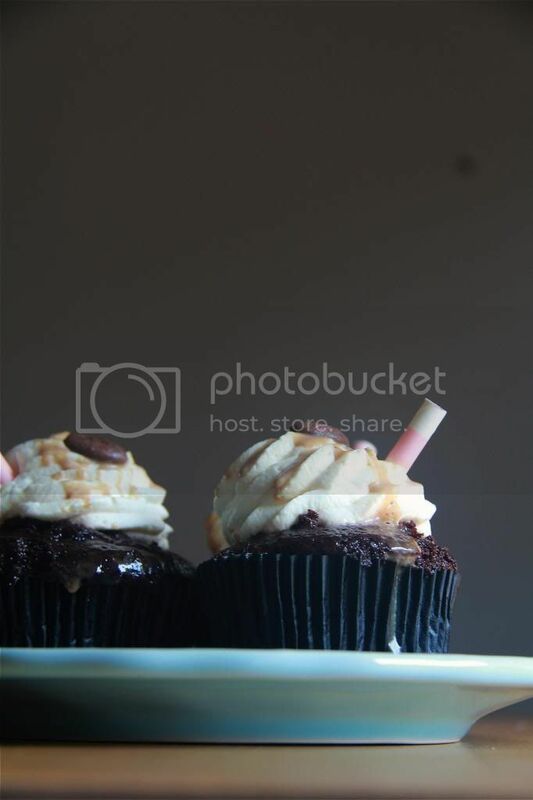 Stick a straw into each of the cupcakes at an angle, if you have some.